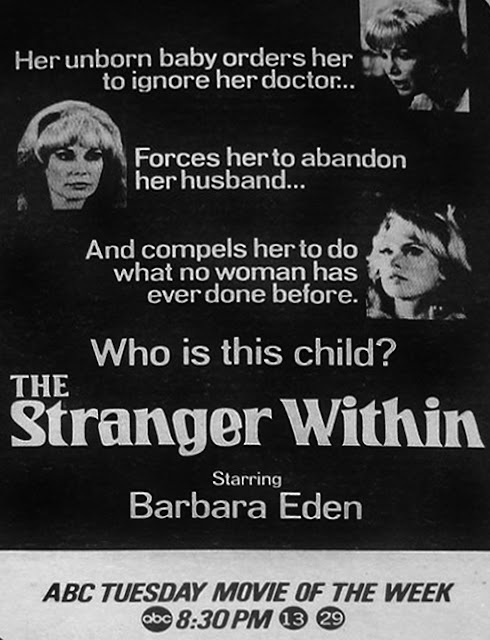 In The Stranger Within -- a TV movie that first aired on ABC in 1974 -- a painter and housewife, Annie (Barbara Eden) learns that she is pregnant. Delight soon turns to mystery and paranoia, however. Annie's husband, David (George Grizzard) has had a vasectomy, which means that he cannot possibly be the father of the child she is carrying. Annie insists she has never been unfaithful to David, but there is no other way to account for her unusual and fast-developing pregnancy. David wants Annie to get an abortion, but on both occasions to have the procedure, Annie is felled by debilitating abdominal pains. After the second such attack, she declares that she intends to keep the baby. David is upset and worried. Three years earlier, Annie had a dangerous and unsuccessful pregnancy; one that nearly killed her. The pregnancy unfolds in a sinister and unusual way. Annie begins eating plates of raw meat, and loads of salt. In her sleep, she speaks in some unknown, inhuman language. And she develops the capacity to speed read whole books in minutes. She soon comes to believe in the special nature of her child, and fiercely defensive of him. Meanwhile, David grows more and more concerned about his wife. A hypnotist (David Doyle) learns from Annie the truth about her pregnancy. The Stranger Within (1974) is a unique spin on Rosemary’s Baby (1968). As you recall, that Roman Polanski film, based on Ira Levin’s novel, concerned an American housewife impregnated by Satan. The Stranger Within concerns an American housewife impregnated by aliens. Fortunately, the great Richard Matheson is the writer behind this story, and he is able to create a tale that is more than mere knock-off. Of course, there are some elements in common. Both tales track an abnormal pregnancy, and the manner in which that pregnancy sows distrust and estrangement between a husband and wife. Doctors are involved in both stories two, though in the case of The Stranger Within, there is no conspiracy on the part of members of the medical community. What may prove most interesting about The Stranger Within is the turn it takes after the second hypnosis. Annie’s husband, David, asks why this is has happened to his wife, why she is “the only one” to endure this alien gestation. The hypnotist looks at him -- and quite chillingly -- responds that there is no evidence to suggest that she is the only one dealing with alien impregnation. Those words actually inform the climax of the telefilm. After delivering her alien child, Annie emerges in a field in the hills, with roughly twenty other human women. They are all carrying their hybrid progeny, and are then “taken” by the aliens, whisked away from Earth, presumably never to be see again. Indeed, she was not the only one. My only problem with this surprise is that it isn’t entirely motivated in terms of Annie’s story. She went to her doctor (played by Nehemiah Persoff) many times throughout her dangerous pregnancy. He even shared her unusual test results -- the baby has two hearts! -- with his colleagues. If other women -- over a dozen other women -- are undergoing the same experience, it stands to reason that they too would visit doctors, and that they too would get a lot of attention from the medical community. These women all live in the same geographic area, we must presume. Twenty cases like Annie’s would be hard to keep secret in any one town, or even city. 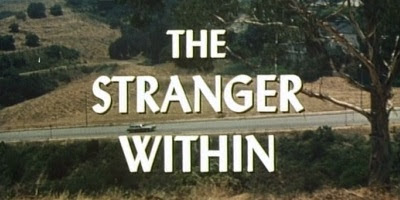 The Stranger Within was released not long after Roe vs. Wade was decided by the Supreme court, and abortion was made legal in the United States. I suppose one possible reading of the film is as a kind of under-the-surface pro-life tract. All the women involved in these apparently immaculate conceptions don’t choose to abort their children. Their husbands -- if they are at all like David -- all counsel abortion. They can't love children they don't see as their own. They want them terminated. In the film’s last scene, the women and their children are assumed into Heaven, essentially, with their children, never to be seen again here. On Earth, their husbands suffer, alone and confused, never again to have a wife, or a child, for that matter. Again, that’s just one possible reading. 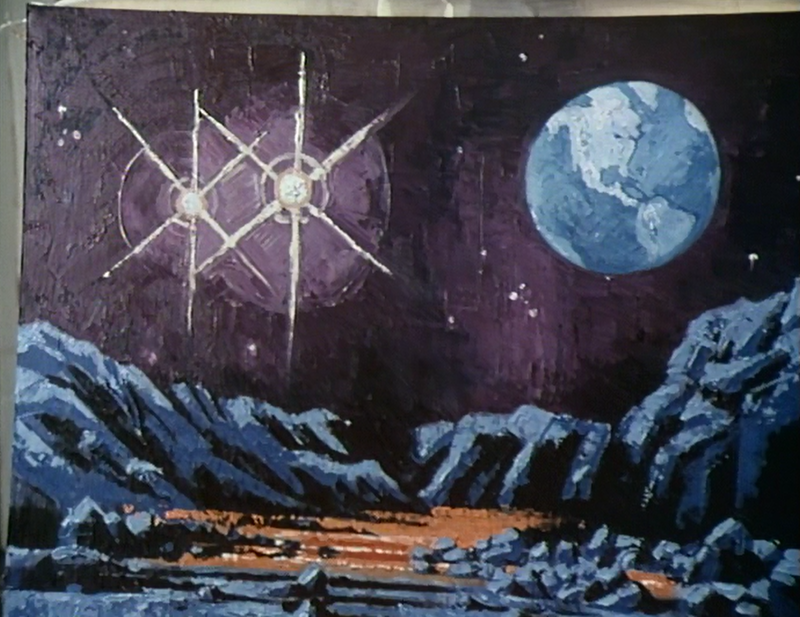 More important to me, however, is the fact that this ultra-cheap TV movie from the 1970s creates a pretty effective ending, considering the paltry budget at its disposal. We see the women enter the clearing, and through a double exposure, they vanish from this Earth with their children. It doesn’t seem like a violent taking away (which gives rise, in part, to my interpretation, above). 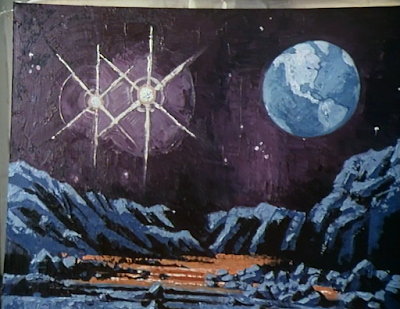 This image is cross-cut with David at home alone, as he gazes at Annie’s painting of the alien environment. The evidence of alien involvement burns up before his eyes, smoldering and smoking. He runs to the window, apparently realizing what is happening, and we see him -- symbolically trapped within the outline of a window frame -- gazing up at the Heavens. He is fully aware that his wife has been taken, body and soul, from him. The camera zooms in on the sun -- our avatar for the aliens (or the Holy Ghost, if this is a pro-life tract) -- and we understand that David is being punished, his “normal” life now no more than ashes, like Annie’s painting. Basically, this ending makes splendid use of (cheap!) 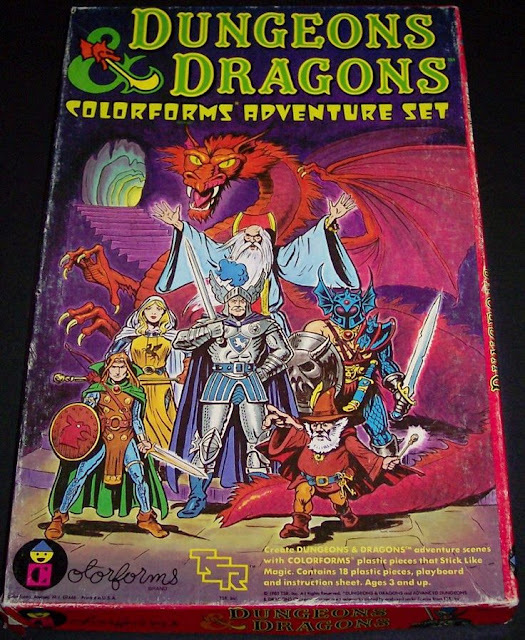 film grammar, when certainly, today, we would get (expensive) CGI effects instead. We’d see the women beamed up to a UFO, for example, instead of simply the double exposure disappearance, and focus on the sun as a figure of mystery in the sky. I maintain that The Stranger Within’s approach -- open to interpretation -- is far scarier. There's something genuinely terrifying about the film's last shot. 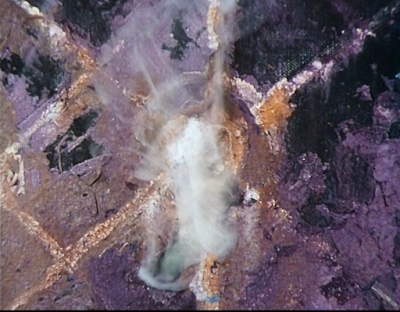 The painting just burns and burns, as end credits roll. There are aspects of The Stranger Within that are a bit comical, for instance Annie getting drunk on coffee, or over-salting her food constantly. And yet Barbara Eden commits to the material, and the film succeeds, like so many TV movies of the 1970s, in being highly unsettling. The ambiguity is frightening, and we are left with no answers. What will happen to these women? Their children? Will they ever be returned? Where are they headed? Rosemary’s Baby is a great film, but The Stranger Within is a cheap-jack -- if unique and memorable -- variation on a theme, and one that ends on a high (if diabolical and upsetting…) note. Personally I find the whole thing to be a very unintentional comedy. John, very interesting review of The Stranger Within(1974 tv movie) which makes me want to see it. I am shocked that I missed this one. If only someone had specifically asked Richard Matheson what exactly this script was saying, then you would know if your review was accurate to what he was stating. Both Barbara Eden, post I Dream Of Jeannie, and Elizabeth Montgomery, post Bewitched, smarty chose these radically different dramas. I am glad you reviewed it and it does make a sequel seem fascinating. I am surprised that this Richard Matheson script has not been remade. 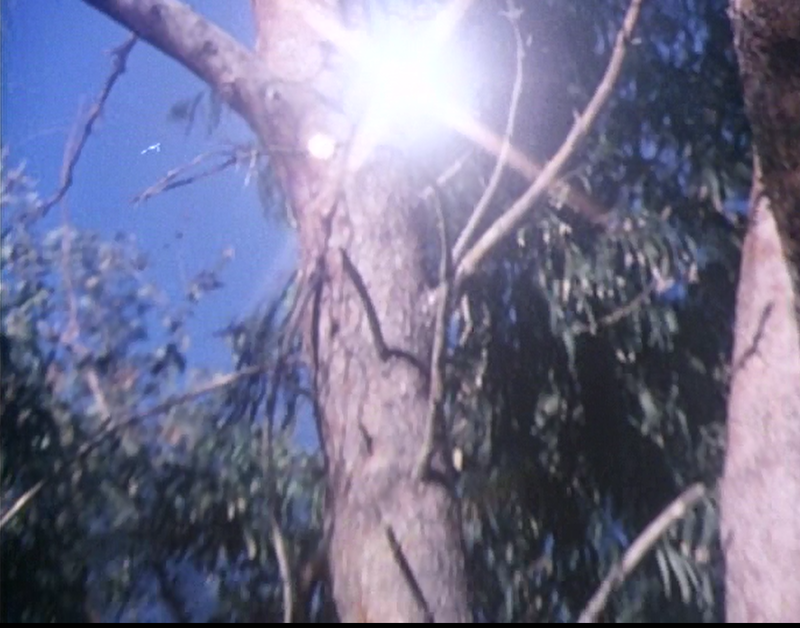 I also am surprised that this eerie work of Richard Matheson's work was never remade on a bigger budget. 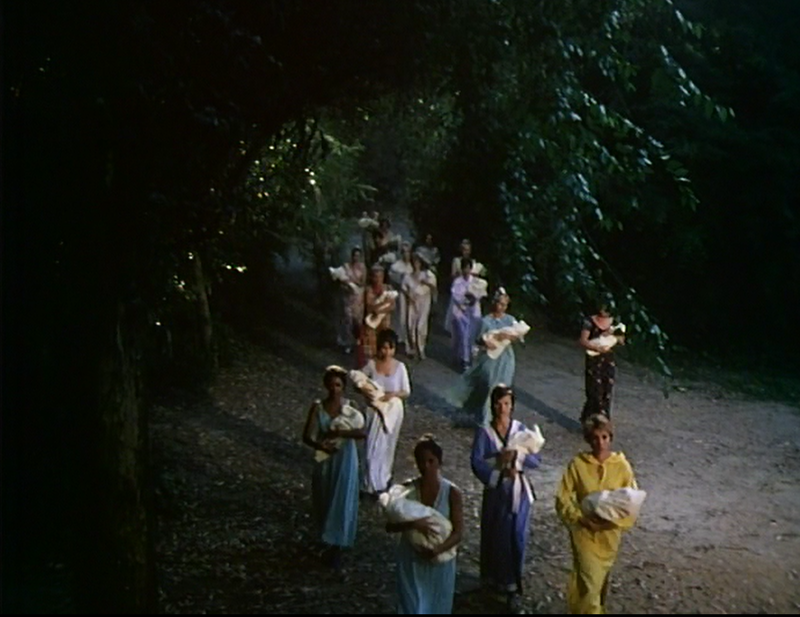 I agree it has some commonality with "Rosemary's Baby", but it also recalls to me the immaculate alien conception theme of "Children of the Damned", the 1964 sequel to "Village of the Damned". 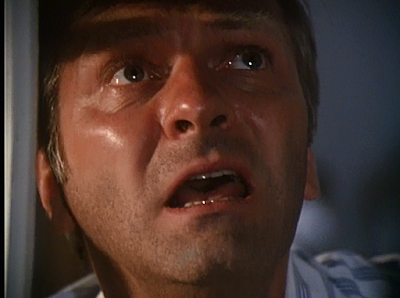 I think it is even more similar to the 1977 theatrical movie "Demon Seed", in which Julie Christie's character is impregnated by an artificial intelligence named Proteus (voiced by Robert Vaughn). The Seventies were filled with this impregnation theme-- "It's Alive" (1974), "Embryo" (1976), "Beyond the Door" (1974), "Sharon's Baby" (1975), etc.--which was a twist on earlier possession/replicant themes of "Invasion of the Body Snatchers", "I Sing the Body Electric", "Do Androids Dream of Electric Sheep". "Body Snatchers" was even remade in 1977 and 1975 gave us "The Stepford Wives" (1975). And of course, nothing could top Lee Remick and Gregory Peck spawning the Antichrist in 1976's "The Omen"!